Designed to roll out, set up in seconds, and transform any garage or driveway into a practical workshop, the Portamate Deluxe Miter Saw Work Centre takes the concept of multi-functionality to the next level. Bench top planers, band saws, scroll saws, miter saws, and more can be used interchangeably, and the miter saw work centre's universal machinery mounts snap securely to the aluminum top for quick tool changes. The ruggedly built aluminum stand measures 49-inches wide, but it expands to an impressive 8 ft. for cutting long mouldings, siding or deck boards. It also features a four-outlet power centre for convenience and safety, and it comes with an LED work light with integrated machine mount. Other user-friendly features include a convenient storage compartment for pencils and keys as well as two adjustable work supports that have fold-down rollers. Quick Release work support extension locks extend to 8 ft. long and hold up to 500 lbs. 1 Year Limited Warranty. For information on this product, please call our Customer Service Centre at 1-800-866-5749. The DEWALT FLEXVOLT DHS790AT2 offers flexible power options - corded for unlimited runtime or cordless for portability powered by DEWALT brushless motor technology. Accuracy is delivered through adjustable miter scale with 11 positive stops and high visibility bevel scale the CUTLINE blade positioning system. The kit includes 2 60V MAX lithium-ion battery packs, a dual port fast charger and the DC120A corded power supply. Powerful 15 amp. 4,600 RPM motor with a laser guide system indicates the cut line for reliable cuts every time and a rotating table has 9 positive stops at 0, 15, 22.5, 30 and 45 right and left. Comes complete with 80 tooth carbide blade, extension wings, 2 position hold down vise, dust bag and arbour wrench. Powerful 15 amp. belt drive motor for enhanced motor to arbour power transfer and a twin laser guide system indicates the cut line on both sides of the blade kerf for reliable cuts every time. Dual compound cuts (miter and bevel) up to 45 left & right. Comes complete with a 2 position vertical hold down vise, 2 position horizontal hold down vise, retractable extension wings, dust bag, blade socket wrench and 60 tooth carbide-tipped blade. 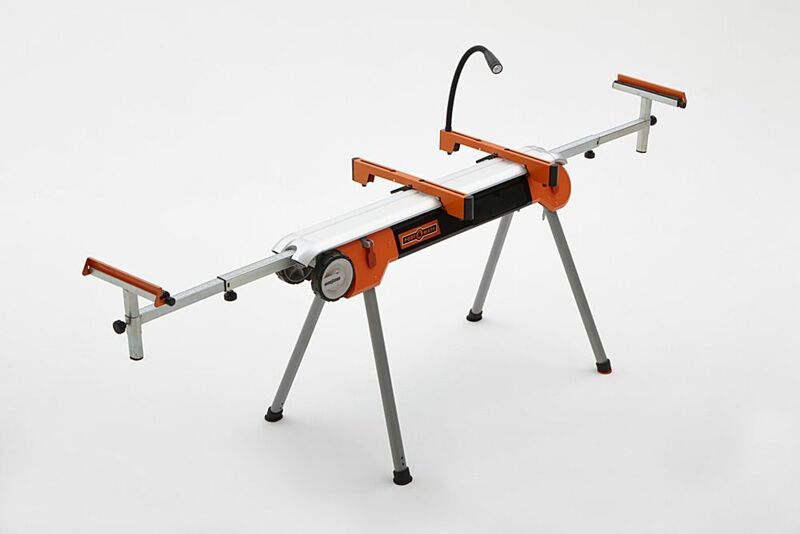 Deluxe Miter Saw Work Centre Designed to roll out, set up in seconds, and transform any garage or driveway into a practical workshop, the Portamate Deluxe Miter Saw Work Centre takes the concept of multi-functionality to the next level. Bench top planers, band saws, scroll saws, miter saws, and more can be used interchangeably, and the miter saw work centre's universal machinery mounts snap securely to the aluminum top for quick tool changes. The ruggedly built aluminum stand measures 49-inches wide, but it expands to an impressive 8 ft. for cutting long mouldings, siding or deck boards. It also features a four-outlet power centre for convenience and safety, and it comes with an LED work light with integrated machine mount. Other user-friendly features include a convenient storage compartment for pencils and keys as well as two adjustable work supports that have fold-down rollers. Deluxe Miter Saw Work Centre is rated 2.3 out of 5 by 3. Rated 1 out of 5 by piotrek from Terrible build quality. Used it on two deck jobs and both support arm are sagging now. lost some ... Terrible build quality. Used it on two deck jobs and both support arm are sagging now. lost some locking pins. Very sharp edges to carry this one around. Rated 5 out of 5 by JFor10 from Great work stand I purchased a Port a Mate PM7000H about 3 years ago (same model but without the extra attachments). I'm extremely pleased with it's flexibility and sturdiness. I do my own home maintenance and renos and after looking at the other stands out there, this is the best. It's easy to set up and attach my tools to (mitre saw or small table saw) I must say though that I take care of my tools, I maintain them in good working order and equipment and don't leave them outside in the rain for it to rust. I highly recommend this stand. Rated 1 out of 5 by Sheamus from Do Not Buy this item Purchased this stand in Dartmouth NS on sale for $150. It is EXTREMELY heavy. The wheel helps with mobility, but it tips, nearly breaking your wrist. It is made form poor-grade steel, and rusts easily,especially where the paint peels off. The paint peels off easily. Be prepared to add an extension cord immediately. The clamps, once attached to the saw, are difficult to clip on to the stand. It comes with poorly made and generally useless accessories that will clutter up your shop unless you immediately throw them away, as there are no spare bulbs, etc. If I wanted an immobile monster, I would have made one. Save up for something better.